Spend less time planning your trip and more time exploring our scenic region with our Vacation Guide! Whether you’re wishing for a romantic getaway or simply wanting to reconnect with yourself, you’ll find an excellent survey of things to do in Murphys, CA, and the Sierra Nevadas, which are all listed in our complimentary travel planner. By requesting a copy of our free Vacation Guide, you’ll unlock our top recommendations for the Northern California attractions right at your fingertips. It’s almost as if you’ve got a tour guide in the palm of your hand! Nestled in between Yosemite National Park and Lake Tahoe, Murphys beholds the title of “The Queen of the Sierras.” With Courtwood Inn as your rendezvous, you’ll have easy access to explore our stunning region. Pass through the high country on the Ebbetts Pass Scenic Byway, then drive down past the picturesque lakes to your final destination, the New Melones Reservoir. On your journey, stop in the Calaveras Big Trees State Park, where you can walk the wood-built trails beneath the majestic Redwood trees. Marvel at the sheer magnificence of these centuries-old beauties. In our part of California Gold Country, there’s no shortage of captivating things to do that’ll make your vacation the best one yet! Enriched by ore from the Sierra Nevadas, Murphys flourished during the Gold Rush and continues to maintain its spirit of welcoming visitors from across the globe. As you walk down our scenic Main Street, you’ll be delighted by the 19th-century architecture, manicured green spaces, and inviting atmosphere. While the beauty of the Sierra Nevadas and Murphys are both magnificent, we encourage you to head indoors to learn more about our historic town at one of the informative museums. Our area has always kept close ties to its past, which is now embedded into the mentality of our locals and woven into the very fabric of our town. You won’t want to miss the opportunity to learn more about our local culture! Our Vacation Guide is one of the best tools for creating the most romantic evening with your beloved. Peruse the best dining options, which are all listed in one place for your convenience along with websites so you can easily book your table. You’ll find a charming collection of wonderful restaurants, quaint eateries, and coffee shops. We’ll even provide you with the best wineries in Northern California, as well as the most inviting tasting rooms in downtown Murphys. When it’s time to search for intimate lodging in CA, book your couple’s retreat with us at Courtwood Inn. Our hilltop bed and breakfast features views of the rolling Sierra Nevada Foothills and the San Joaquin Valley, as well spacious accommodations and some of the best sunset views in California. It’s the perfect place for you and your special someone to escape the hustle and bustle of your daily routine. You can even book your stay in our luxurious Massage Studio. 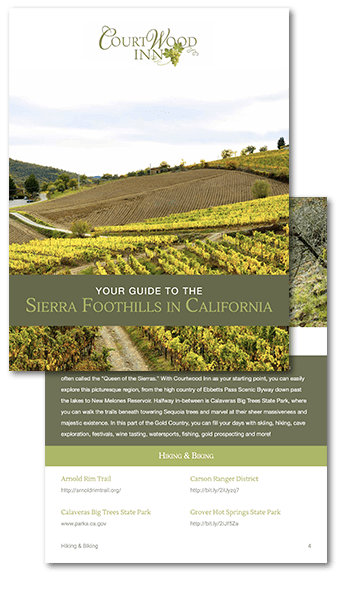 Simply complete the form below and receive your free Vacation Guide to the Sierra Nevadas and Murphys to unlock everything our area has to offer today!